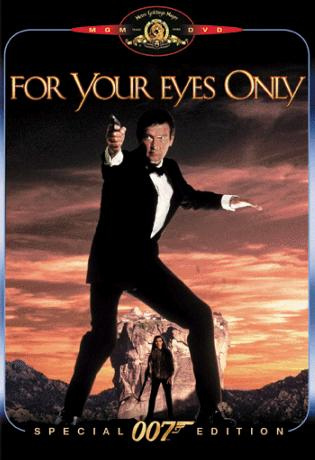 For Your Eyes Only (1981) is the twelfth spy film in the James Bond series, and the fifth to star Roger Moore as the fictional MI6 agent James Bond. It marked the directorial debut of John Glen, who had worked as editor and second unit director in three other Bond films. "When a British ship is sunk in foreign waters, the world’s superpowers begin a feverish race to find its cargo: a nuclear submarine control system. And 007 is thrust into one of his most riveting adventures as he rushes to Greece and Albania to join the search…and prevent global devastation." For Your Eyes Only is considered by many to be among the best of the Bond films, for a simple reason: It features all of Bond's signature traits -- the wisecracks, the women, the gambling, the cars, the stunts, the travel, etc. -- but it does so with elegance and moderation. 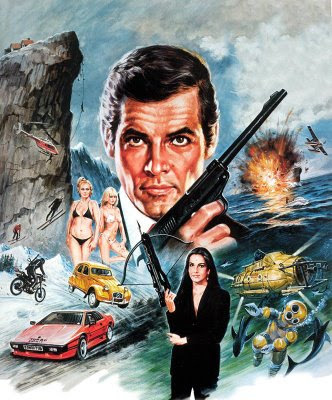 Probably the most memorable scene in the movie is towards the end, when James Bond is sent to Meteora, Greece to retrieve a stolen "ATAC" system that could be misused for controlling British military submarines. There the fiendish villain Kristatos hangs out in his unreachable lair, holding a young girl, a hopeful Olympic ice skater, who is being sequestered by her coach and an evil sponsor, who has a small computer device that controls the U.S. nuclear submarine fleet’s missiles. The eyebrow-raising 007 attempts to shimmy up the sheer cliff-face, while dastardly minions try to kick him off. The lair is actually the Monastery of the Holy Trinity, known in the movie as the Monastery of Saint Cyril, the most isolated of all the monasteries. It is also perhaps the one with the most striking location, set on a huge standalone pinnacle, with an incredible view of the valley and city of Kalambaka below. Several of the agents with James Bond reach the monastery via the windlass and basket, which is indeed high above the ground. In the movie, the windlass has an electric motor, which does not exist. Also in the movie, the windlass room is shown as an enclosed separate area, which is not accurate. The chapel where the ice skater is held is much smaller in real life also. Unable to use the windlass, James Bond climbs the rock pinnacle using technical equipment, which is much more vertical than shown in several scenes in the movie. The scene at Meteora is perhaps the most Hitchcockian moment in any Bond film, and it is the most like a European art film. Once the climb begins, no one speaks for several minutes while Moore (and his stunt double) makes his way up the rock cliff, even as he is spotted by a henchman, who sends Bond tumbling over the edge, where he dangles hundreds of feet above the ground. With very little music and absolutely no dialogue, the scene is as lean and effective as the bank heist in Jules Dassin's Rififi (1955). Roger Moore said he had a great fear of heights, and to do the climbing in Greece, he resorted to moderate drinking to calm his nerves. Later in that same sequence, Rick Sylvester, a stuntman who had previously performed the pre-credits ski jump in The Spy Who Loved Me, undertook the stunt of Bond falling off the side of the cliff. The stunt was dangerous, since the sudden stop at the bottom could be fatal. Special effects supervisor Derek Meddings developed a system that would dampen the stop, but Sylvester recalled that his nerves nearly got the better of him: "From where we were [shooting], you could see the local cemetery; and the box [to stop my fall] looked like a casket. You didn't need to be an English major to connect the dots." The stunt went off without a problem. Director John Glen didn’t use much of the actual monastery in the film, but had a more usable monastery-set built on the rock next to Holy Trinity. This rock was also used for other close-ups. For the Meteora shoots, a Greek bishop was paid to allow filming in the monasteries, but the uninformed Orthodox monks were mostly critical of production rolling in their installations. After a trial in the Greek Supreme Court, it was decided that the monks' only property were the interiors – the exteriors and surrounding landscapes belonged to the local government. In protest, the monks remained shut inside the monasteries during the shooting, and tried to sabotage production as much as possible, hanging their washing out of their windows and covering the principal monastery with plastic bunting and flags to spoil the shots, and placing oil drums to prevent the film crew from landing helicopters. The production team solved the problem with back lighting, matte paintings, and building both a similar scenographic monastery on a nearby unoccupied rock, and a monastery set in Pinewood. This was all done despite the comment by Roger Moore, who told the monks politely that he ‘once was a saint himself’. After the production of James Bond at Meteora, the monasteries were never the same again. Founded in 985 A.D. by monks from Mount Athos, one thousand years later in October of 1980 disturbed monks began leaving Meteora back to Mount Athos. The popularity of the film which brought many tourists and the disturbance from production no longer offered the monks the solitude and quiet they desired. Though problems with heavy tourism began about a decade earlier, when the monasteries became more accessible.